In case you hadn’t noticed, online courses have become all the rage in the last few years. Seriously – you can find a course online for just about ANYTHING. While there are tons of benefits to being able to find quality information and training on pretty much any subject you want, when it comes to choosing courses as investments into your business there are definitely things you want to consider before pulling the trigger. In this episode we are chatting about best practices when it comes to buying courses and then how to actually leverage them once you have purchased. Because no one likes wasting time or money, right?! 1. Don’t get caught up in the hype. Oftentimes affiliate marketing will play a big role in the overall marketing strategy of course launches and how it can be easy to get sucked up into the hype course affiliates are putting out there. It’s important to “vet” your sources and try to determine if they genuinely love the course….or if they’re just greedy and in it for a payday. 2. Research the course creator – do your due diligence! These days anyone can make a course about anything – you don’t need a degree in rocket science to put together some slides with Wikipedia’d information and upload it to an online platform to sell. When you discover a course you are interested in, do your due diligence in terms of properly vetting the course creator. Ask yourself, “Do I trust this person? Do they have the chops to teach me x, y and z?” Evaluate the actual reasons you have for why this person is the right person to teach you what you’re wanting to know. Do you research and sell it to yourself. 3. Determine if the course will actually be worth your time. Many business owners when they’re just starting out try to learn and do #allthethings because they don’t want to outsource tasks until they feel financially capable of taking that step. Learning how to do #allthethings via courses seems like a good starting point – and often times, it is! But you have to consider the very real possibility that there are some things you just shouldn’t spend your time doing because they will never fall in line with your gifts and will actually continue to waste your time rather than make your time more profitable. 4. Determine if your business really requires this skill or information. It can be easy to think that your business needs #allthethings in order to be successful in the online space….but that’s hardly ever true. There are tons of different approaches and strategies and tools out there that can help you grow your business….but you won’t need all of them, only the ones that are right for you and your business. 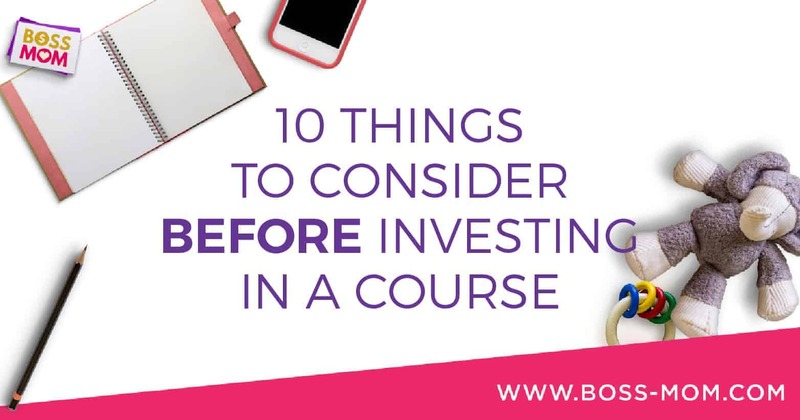 Don’t just invest in a course because you think you need to. Not all course takers are created equally! Typically there are two types of course takers: the “Doers” and the “Thinkers.” The Doers just want to get in, zero in on the parts that they want, devour them and then act on what they learned. The Thinkers want to go through systematically and thoroughly consume all the information so they can fully own it and then implement. Some courses are laid out to accommodate both types of people. Some are not. You don’t want to get stuck with a course that isn’t in a format that will be conducive to your course personality type. If you aren’t sure, reach out to the course creator to ask! 6. Assess whether the course aligns with your business goals. 7. Assess whether the course aligns with your calendar. The reality is that time is not an unlimited resource and even if we desperately want to be able to take a course that seems valuable, our calendar and schedule may simply not allow it. Be honest with yourself about the time you have and make decisions accordingly. 8. Recognize that you will have to do the work. Magic doesn’t just suddenly happen the moment you hit the “buy” button and enroll in a course. Think of it like a college class. The professor will show up and impart his information to you, but you have to show up and do the work to actually get anything out of it. Speaking of getting what you want out the course…..you’ll want to know what exactly it is that you want to get out of it BEFORE you buy. Lay it out for yourself. What will this course help you accomplish in terms of moving your business forward? Is the primary focus to learn a skill? How will that skill help your business? What do you want it to gain you? Do you want more clients at the end? More confidence? More leads? Know what you want so you can stay focused as you move through the course. Too often people get jazzed about a new course, sign up…..and then let it sit there taking up space on the internet instead of in their brain or business. If you’re going to be decisive in taking action to purchase a course, follow it up with blocking out time in your calendar to actually complete the course. Set yourself up for success the moment you purchase. The longer you wait, the less likely you are to actually leverage your investment.